Six films by celebrated French auteur Jean Renoir. 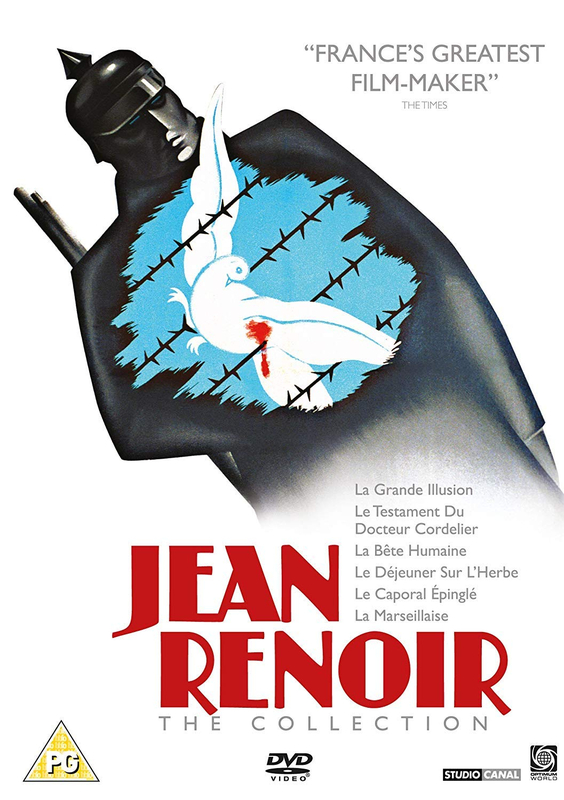 La Grande Illusion (1937) is an archetypal prison escape film, generally regarded as Jean Renoir's most popular film of the 1930s and one which, although often seen as a humane and pacifist indictment of war, offers an ambiguous perspective on class politics. Set in a WWI German prisoner-of-war camp, the film tells the story of three French soldiers, the working-class Marechal (Jean Gabin), the middle-class Jew, Rosenthal (Marcel Dalio), and the aristocrat senior officer, Boieldieu (Pierre Fresnay), who are held prisoner by Commandant Von Rauffenstein (Erich von Stroheim). The film shows how a bond of sympathy exists more between the German Commandant and the senior French officer than between the three Frenchman of different social backgrounds. In Le Dejeuner Sur L'Herbe (1959), Etienne Alexis, a candidate for president of the new Europe, is a scientist promoting artificial insemination as a means of social betterment and an antidote to carnal passion. In Le Caporal Epingle (1952), an upper-class corporal from Paris is captured by the Nazis when they invade France in 1940. La Marseillaise (1938) is a news-reel styled film about early part of the French Revolution, shown from the perspectives of people across the country. In Le Testament Du Docteur Cordelier (1959), a lawyer, Joly (Teddy Bilis), is disturbed when his friend, the eminent psychiatrist and researcher, Dr Cordelier (Jean-Louis Barrault), makes out a will leaving everything to a mysterious stranger, Opale (also played by Jean-Louis Barrault). Finally, La Bete Humaine (1938) is an adaptation of the novel by Emile Zola. Jean Gabin plays a train driver who falls in love with a colleague's wife, Séverine (Simone Simon), whose jealous husband has already murdered his wife's former lover.